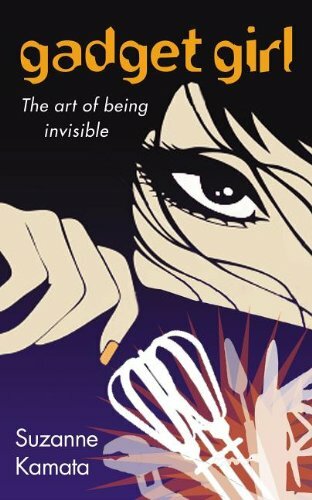 Reader Gut Reaction: Gadget Girl: The Art of Being Invisible, by Suzanne Kamata, comes out in May, but I've been cleared by the author to get some buzz going—and I'm thrilled to be able to do so with a book that deftly handles many facets of the mixed-race/bicultural experience. In fact, I was impressed by how many "issues" (for lack of a better word) the author was able to include without seeming like they were gratuitously crammed in—rather, narrator Aiko's life is a realistic mess of desires, fears, embarrassments, love and hope. Concerning Character: Aiko Cassidy is half Japanese, but she's never known her father, who is an indigo farmer in Japan. But she wants to meet him someday, and so she eagerly consumes every bit of Japanese culture that she can, especially if it's got to do with manga. Having inherited quite a bit of talent from her artist mother, Aiko draws her own semi-autobiographical manga called Gadget Girl. But when her mother announces their summer vacation, Aiko is devastated: they're not going to Japan after all. They're going to…Paris? Yep. Her mother's won a prestigious art award and that's where they're going. This brings a whole lot of family issues to the fore, because her mother's main sculpture subject is Aiko herself. And Aiko? Well, she has a curled left arm and a limp from cerebral palsy. At heart, this story is in many ways a study of Aiko's changing relationship with her mother, as she learns to accept others and, in doing so, learns to accept herself. However, we also see her gain more confidence and courage, and learn to be who she is when her mother isn't around, when she doesn't have an immediate support system, and that's truly gratifying. Recommended for Fans Of...: Stories about coming of age and finding yourself when you're traveling, like Thirteen Little Blue Envelopes by Maureen Johnson or the Traveling Pants books; stories about the mixed-race experience and growing up sort of between cultures. I think this one is particularly suited to MG and younger YA readers. Themes & Things: What doesn't this story cover? In some ways I found myself wishing it was longer, because then it would be possible to delve even more deeply into some of the themes. I was impressed with how the author handles the bicultural aspects of the story, bringing in issues that a lot of mixed-ethnicity readers will find familiar: the fact that there are many cases in which the marriage doesn't work and the kid(s) get brought up in one or the other culture exclusively; the fact that there might be a new family with new half-siblings; the fact that extended families in traditional cultures have different ideas when it comes to half-breed kids. These are important, and I know there will be plenty of readers for whom this will resonate and who will feel less alone because of it. The other theme I thought the author explored particularly well was that of acceptance, particularly self-acceptance. Disability or not, self-acceptance is not an easy task, and Aiko has plenty of reasons why she feels like she's invisible; but Aiko has a strong support system, and she's able to take major steps in the journey toward realizing she has the right to the same desires and dreams as anyone. I particularly loved her stepfather Raoul (yay for awesome step-parents!). Despite a few moments that made me teary, it's ultimately a hopeful story, and I'm glad to see another addition to the mixed-race YA fiction oeuvre. Cover Chatter: I absolutely LOVE that cover. It's fun and colorful and appropriately manga-esque—but it's got that touch of humor in the eggbeater and other gadgets, too. And the eye is definitely eye-catching. Total win. You can find Gadget Girl by Suzanne Kamata online, or at an independent bookstore near you! This is definitely on my wish list, so I'm glad to read your review. The premise grabs me. And yes, I love the cover. Wow, this sounds like a fun, endearing, and fresh twist on things. Looks great. This sounds very good, and I shall add it to my list! Thanks. It was an enjoyable read! I did wish it had delved a bit more into certain aspects--for me, it moved a little quickly in some ways--and maybe that's because it included so many meaty themes. Yay! This made me so happy! Thank you so much for reading Gadget Girl and reviewing it on your blog! !